Locally owned and dedicated to fast, friendly and professional service! If you are looking for a Rockledge Pharmacy that is dedicated to giving its customers personalized care and exceptional service, then Space Coast Community Pharmacy is the place for you! Located on South Fiske Blvd in Rockledge, Florida, Space Coast Community Pharmacy is locally owned and operated. As a service oriented pharmacy, we truly put serving the customer first. We offer the flexible and personal approach of the old time neighborhood pharmacy. Although centrally located in Rockledge, we are dedicated to providing the highest quality of care to our Brevard County patients, including the neighboring communities of Cocoa, Merritt Island, and Melbourne,FL . We will make your health our number one priority. Come in today, have a look around and make yourself at home! Space Coast Community Pharmacy prides itself on being more than just a place that fills prescriptions, it is a place that offers complete solutions to all your medical needs. Space Coast Community Pharmacy cares about YOU. We know that sometimes it’s just not convenient for you to wait at the pharmacy or drive to the pharmacy to pick up your medication. For your convenience, we offer FREE medication delivery. 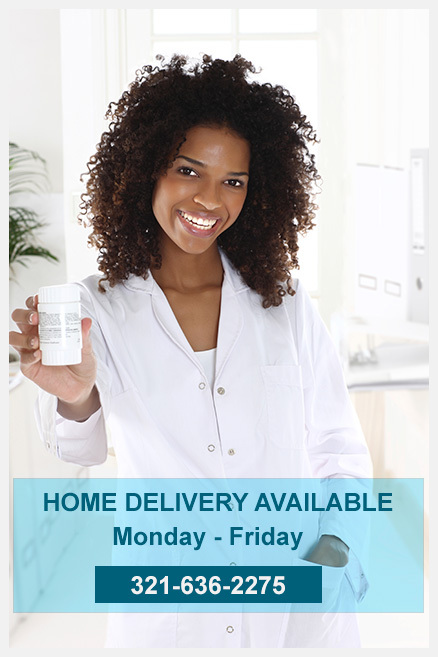 – FREE Shipping on all orders containing prescriptions to locations in Florida. – FREE Delivery of prescriptions in Brevard County, FL. Please call us during regular business hours for more information on delivery options: 321-636-2275.